Aug. 9, 2017: Given adequate sunlight and nutrients, phytoplankton populations can swell into blooms large enough to be visible from space. 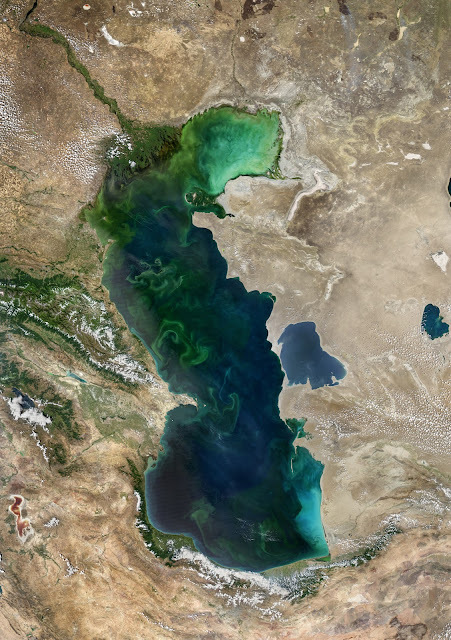 On August 3, 2017, the Moderate Resolution Imaging Spectroradiometer (MODIS) on NASA’s Aqua satellite acquired this image of several blooms in the Caspian Sea. The Caspian Sea is the largest enclosed inland body of water on Earth by area, variously classed as the world's largest lake or a full-fledged sea. It is in an endorheic basin (a basin without outflows) located between Europe and Asia. It is bounded by Kazakhstan to the northeast, Russia to the northwest, Azerbaijan to the west, Iran to the south, and Turkmenistan to the southeast.